Until this development, Goyal’s departure had been seen as a key element of any revival strategy. The lenders have asked for legal advice on how to respond to the move by Goyal, who recently quit as chairman and director and had previously said he was ready to sacrifice control of the carrier to ensure its survival. 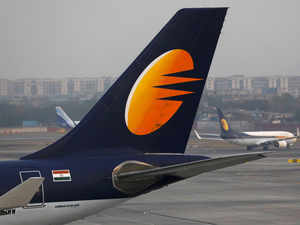 MUMBAI: Jet Airways founder Naresh Goyal filed an expression of interest (EoI) for a stake in the ailing carrier just as the deadline for submissions was coming to an end on Friday, said two people with knowledge of the matter. The move is said to have flummoxed lenders, who have put the equity on sale as part of a rescue plan for the airline. They have asked for legal advice on how to respond to the move by Goyal, who recently quit as chairman and director and had previously said he was ready to sacrifice control of the carrier to ensure its survival. Until this late development, Goyal’s departure had been seen as a key element of any revival strategy, having been unable to prevent the airline’s slide. Goyal and Jet officials couldn’t be reached for comment. Details of Goyal’s EoI weren’t available. A senior executive of State Bank of India said all EoIs are being examined by the legal department for their authenticity and that this is part of the normal procedure. He didn’t elaborate. Meanwhile, Etihad has specified to Jet’s lenders in its EoI that it wants to keep its shareholding below 25% and doesn’t want to be the sole or majority shareholder in the distressed carrier. It currently owns 24% of Jet. Etihad and the airline’s top lender SBI didn’t respond to queries. Two people in the know said Goyal is being treated as an “errant promoter”. According to the rules, such a promoter can’t participate in debt resolution once a company has entered the bankruptcy process, but Jet hasn’t got to that stage yet, bankers said. Goyal has pledged a little over 31% of the company’s shares and has agreed to pledge more, totalling 41.1% of the company, people in the know have said. His current total shareholding is 51%. The public owns 25% of Jet. The deadline for the submission of EoIs was 6 pm Friday. The EoIs are non-binding. Etihad submitted its EoI on Thursday night, joining a host of private equity firms including TPG Capital and Indigo Partners. Spokespersons at both firms declined to comment. The government-anchored National Investment and Infrastructure Fund (NIIF) will bid too, people in the know had said. Being a state-run entity, it doesn’t have to submit EoIs. A senior executive at NIIF said he wouldn’t be able to comment. That Etihad’s shareholding remains below 25% “is imperative so that the equity infusion is immediate and the funds actually go to the running of the business; instead of an open offer being triggered which may be used as an exit strategy by minority investors”, said a person with knowledge of the EoI. The next stage is the qualification of bids. Qualified entities must send in binding bids by April 30. Meanwhile, lenders to Jet have told its management to give a fresh loan proposal and will discuss any emergency funding on Monday, the aviation secretary said on Friday. Jet has suspended international flights until Monday, shrunk its operating fleet to 11planes and will further shrink it to six-seven planes during the weekend, said Pradeep Singh Kharola, the aviation secretary. Jet is India’s oldest surviving private airline and was till January it’s secondbiggest with a fleet of 124 planes. Jet’s lenders have internally decided they won’t release loans until there is some clarity on a new investor, said two people aware of the matter. The decision was made in a lenders’ meet on Thursday night. Jet had been assured loans of Rs 1,500 crore — Rs 400 crore in the first tranche and Rs 1,100 crore in the second. Of that, only about Rs 200 crore has been released and has been used up in payments to fuel companies, other vendors besides salaries for December. Lessors have not been paid. Jet’s ground staff surrounded the airline’s corporate office in suburban Mumbai and asked the management for updates on their salary dues, a pilots’ grouping said in an internal communication. The airline’s chief people officer Rahul Taneja could be seen pacifying employees who haven’t been paid for months. Some of them complained about being manhandled by angry passengers following flight cancellations and said the management should be present to tackle the situation. Taneja said he would go to the airport on Friday evening to do so.